The Venezuelan minister of Interior and Justice, El Aissami, said the government had already contacted 7 out of 9 Yanomami communities in the Amazonas state and they said everything is fine on their side. This is a pointless statement, to say the least. Those communities are located in an area, as I mentioned in my previous post, a little bit larger than the Netherlands...but with the densest jungle you can imagine. There are virtually no roads there. The two communities we haven't heard anything yet are the ones about which the Yanomami reported the attack. It's as if someone had reported an attack on Maastricht and authorities located as far as Glasgow would say people have investigated so far in Amsterdam, Rotterdam, Haarlem and Middelburg and things are fine there even if Maastricht is still pending. Those communities are very close to the border. They have never been counted in the Venezuelan census and experts in the area - people I know - are very worried and are sure the attack happened. They just don't know what exactly happened, how many fatalities there were. This is an area where Alexander von Humboldt had to stop his incredible voyage. It hasn't changed that much since 1800 for the Yanomami or for the Venezuelan authorities, but it has changed a lot for those looking for gold and other riches. Dem-Clinton. Chavez caught him at the end of his rule and wisely he deferred the solution to whomever came next. Still, in retrospective, had he invited Chavez to the White House he could have seduced him the way Castro did. Or at least moderated him somewhat since the only thing Chavez ever wanted, besides play ball, was to have his picture taken in the Oval Office. Otherwise how can you explain this hatred against a country of which Chavez personally had nothing to complain of? Rep-Bush. His idiotic adventure in Iraq has changed our world. Had he stuck to Afghanistan only maybe he would have accomplished more. In retrospective, we cannot tell whether the US invasion of Saddam's Iraq sped up or slowed down the Arab spring. The fact of the matter is that the US needed its secure oil supply and the Bush administration was only to happy to accept any insult from Chavez as long as Venezuelan oil kept finding its way North. Even in the pseudo 2002 coup, the US alleged involvement was so diffident that it is almost as if they had wished Chavez to remain, least oil supplies would be perturbed. Dem-Obama. Besides his forced upon hand shake with Chavez Obama has studiously avoided further contact. His policy was rather successful in treating Chavez as a non entity, the more so that Chavez errors finally started catching up with him. In fact, to his credit Obama's administration has encouraged a diminution of oil imports from Venezuela. We do not know whether it was due to Venezuela being a less reliable oil producer of natural antipathy, but regardless of the reason it was a wise move. Then again Obama blew it by declaring that Chavez is not a threat even though all the evidence is to the contrary, from Venezuelan having become a narco state to its support of FARC guerrilla and other assorted "insurgency" here and there. Never mind its alliance with Iran! Rep-Romney? I put a question mark because if Obama is reelected we know that nothing will happen vis a vis Venezuela. A H. Clinton presidency could have been more dynamic on this respect. So, what has Romney said? Nothing convincing, nothing that shows he is truly informed, nothing that indicates a plan, all for strict electoral purposes. That the republicans are not as informed as one would wish them to be can be reminded to us regularly when we read idiotic declarations like the ones of Jon Voight, comparable only to the idiotic ones of the likes of Sean Penn. Of course, one thing is the campaign, another who Romney would appoint at State. This morning Globovision was reporting live the good news that the fire seemed under control. Unfortunately as hunk Reimy Chavez was talking we saw suddenly black clouds billowing and flames. It ain't quite over. Even though the hated empire sent special foam and stuff. Of course, there are useful idiots like James Petras only too willing to come to the rescue of Chavez, no matter what the offense is. Now this character, without any evidence, says that it was all a conspiracy from the empire. Ah! an excuse to suspend elections that Chavez looks more and more like losing! 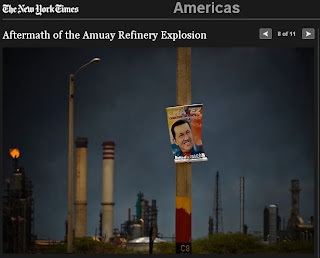 It is difficult to put a just perspective on what happened yesterday in the huge refinery complex of Amuay-Cardon. The Venezuelan state oil company and monopoly, PDVSA, had two gas reservoirs blowing up and killing scores of people (tonight’s count is 39 death and 86 injuries). The state has tried to control the flow of information, reportedly with threats to the media. It is election times and that major disaster is a direct hit to Hugo Chavez. But in an age of Twitter and smart phones, the information cannot be silenced the way it can still be done in worker’s paradises like Cuba or North Korea. Pictures and videos were quickly available, comments and injury reports, and even expressions using the word Gotterdammerung which found its way to the title above. Tonight the Vice president of Venezuela Elias Jaua did a shameful update on TV trying to transform the tragedy into a campaign asset, implying to us that were it not for el Comandante personal involvement it would be all for the worse. Orwell should be so creative. After the oil strike of 2002-2003, what turned into a regime the government of Hugo Chavez was the firing without any regards and compensation of 20,000+ workers of PDVSA. Then excuses from “bloated bureaucracy” to “traitors” were readily used. The rage of the regime against this proficient team, the source of Venezuela’s income, made us witness dramatic scenes such as spouses and children being expelled at night from workers camps at Los Semerucos. Needless to say that the pension savings and legal payment benefits of these workers became arguably the first illegal expropriation of the regime. Since then, not only the company payroll has ballooned to at least four times the 2002 payroll, but PDVSA became one of the most opaque, unsafe oil companies to work for. 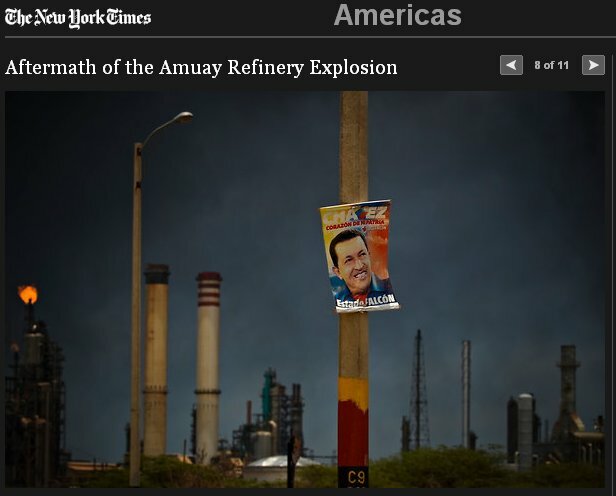 Gente de Petroleo, an NGO formed in 2003 to defend the rights of the fired workers, in a communiqué today report that since 2003 there have been at least 79 accidents in Amuay, with 19 workers killed that we know of. But that is not all: since 2003 PDVSA has been associated with a number of major national disasters in a way that did not happen before 2003. In pollution accidents we go from the chronic contamination of Lake Maracaibo to the recent one in Monagas that left the major city of Maturin without running water for more than a month. Not to mention the stacks of oil derived coke near Piritu that PDVSA cannot be bothered to dispose of and make the area’s air un-breathable. There are also many accidents such as gasoline trucks on the roads without the adequate security measures that have killed bystanders in fiery explosions. Even without fire PDVSA causes major perturbation in the country, such as the Cupira Bridge that links the Eastern part of the country to the rest and that was destroyed last week because a PDVSA crane twice the weight allowance of the bridge tried to cross it anyway. Weeks of costly chaos will follow. Since Chavez put in charge at PDVSA his henchman Rafael Ramirez it has become a true state within the state, an entity that cannot be questioned and even less audited. Any criticism is considered state treason by chavismo. And indeed it has to be treated as such by the regime because all of PDVSA faults, and its reckless wreckage, have to be laid at the feet of Chavez, barely a month before his hoped for reelection.